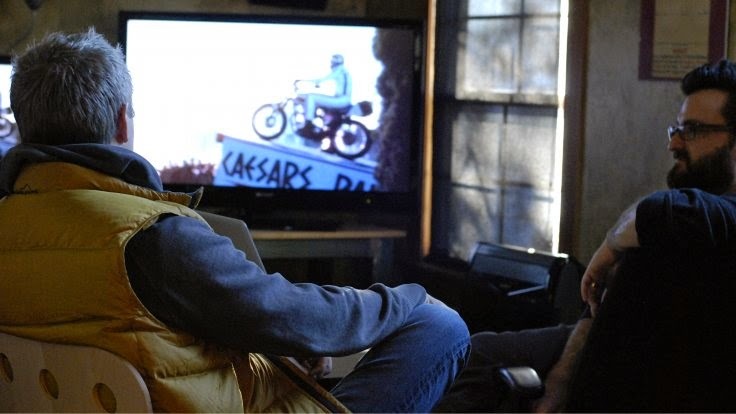 Denver filmmaker Daniel Junge makes his long-awaited premiere at the Sundance Film Festival in Utah with his new film “Being Evel.” CPR arts reporter Corey H. Jones explores the documentarian’s diverse film career. Inspired by the hit ABC series “Shark Tank,” the Denver Foundation has a new, unconventional platform for grantmaking. The “Colorado Art Tank,” asks cultural organizations to pitch their ideas before a live audience. Denver is seeking applications for its first-ever Youth Poet Laureate. CPR arts editor Chloe Veltman spoke with Ken Arkind, director of youth slam poetry organization Minor Disturbance, about what the new position will entail. Back in the day, Caribou Ranch near Nederland was a recording hideout for stars like Elton John, rock band Chicago and singer/songwriter Joe Walsh. As the auction for the property nears, Colorado Matters host Ryan Warner spoke with music producer James Guercio, who built the studio, and bassist Kenny Passarelli. You can also watch videos of famous bands and musicians performing hit songs they recorded at Caribou Ranch. Estes Park artists and creative businesses are working on forming a new art association called Estes Arts Presents in a bid to become a state-certified creative district. Fort Collins native and Colorado State University graduate Duncan Ramsay was a producer for the animated short “The Dam Keeper,” which recently received an Academy Award nomination in the “Best Short Film (Animated)” category. Four people have been charged in connection with last summer’s theft of Dale Chihuly artwork from the Denver Botanic Gardens, the Denver District Attorney’s Office announced Wednesday. After 28 years, Denver cafe Paris on Platte made its final sale last Saturday. Colorado Matters producer Michael de Yoanna visited the popular spot for poets and musicians as it said au revoir. In Denver-based performance troupe Curious Theatre’s latest show, “Charles Ives Take Me Home,” family tension is played out to the music of American modernist composer, drawing parallels between sport and art. Actors Dave Belden and Kate Berry performed a scene from the production in the CPR Performance Studio. Chloe Veltman reports on a Japanese singing competition that's been a staple of the local Japanese cultural calendar for 40 years. Arts happenings around Colorado this weekend: CPR’s Arts Bureau spotlights this weekend’s Colorado cultural happenings, including a cocktail and theater pairing in Longmont, an art exhibition exploring climate change in Boulder and more. CPR arts contributor Jeremy Brieske highlights the top upcoming events for Denver’s biennial celebration of fine art photography, Month of Photography (MoP).